The Bloomingdale area Big Box and residential complex development, which has stirred the community since it first came to light a year ago in February, is again taking center stage within the community as well as in front of the Board of County Commission (BOCC). 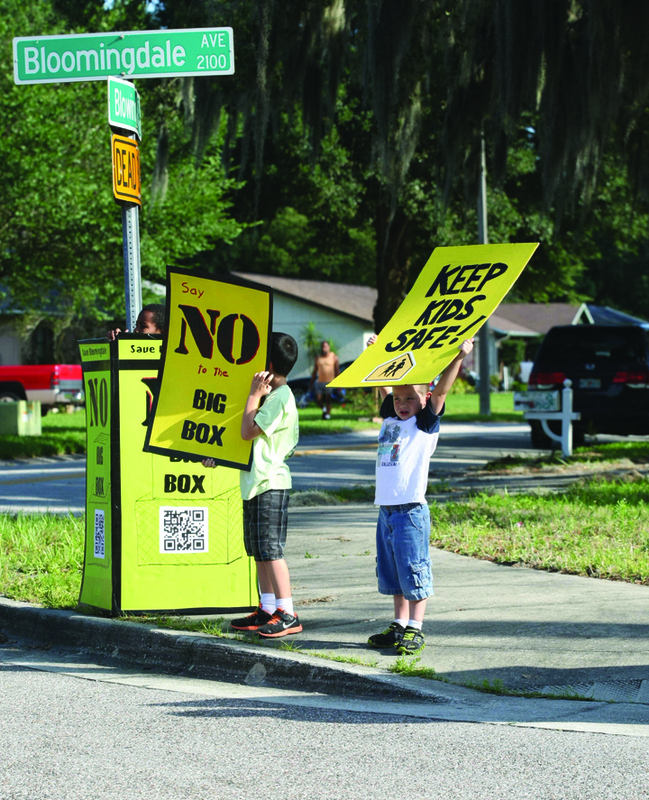 Children hold up signs during a community rally last year opposing the planned Big Box devel-opment on Bloomingdale Ave. Residents are now gearing up for another meeting hosted by the County involving the issue. Today the drama, which has reached the anticipated courtroom phase, continues with more twists and turns, including a public meeting scheduled for Tuesday, February 4 at the Bloomingdale High School Auditorium located at 1700 E. Bloomingdale Ave., in Valrico, hosted by the Hillsborough County Public Works Department to discuss transportation improvements and to receive input from members of the community. The meeting is scheduled to be followed by a subsequent decision by the BOCC at its regular meeting the following day. The latest sequence of events are a direct result of the BOCC’s unanimous vote to accept developer Red Cast Bloomingdale LLC’s contribution of $564,196 toward the costs of road improvement work in the area, which they say could be used by the project. Red Cast is the entity behind the so-called Bloomingdale Big Box development. On December 18, 2013, the BOCC approved the money from the developer, but decided to postpone allocation of the funds to allow the staff to meet with the community. Coordinated Active Neighborhoods for Development Organization (Can-Do) officials said that they are hoping to see a sizable turnout for the upcoming meeting as they believe that the community will not be served if the money is diverted to distant sites like the Bell Shoals Rd. Project or the Lumsden/Lithia Pinecrest Intersection Improvement Project, especially if the Bloomingdale development moves forward. Can-Do spokesperson, George Niemann, confirmed that the organization’s focus has not changed. “Our main concern is that the County will allow the project to move forward and destroy the quality of life in our community,” Niemann said. Niemann also made it clear that the organization’s interest in attending the meeting should not be viewed as any agreement that they are favoring the development. In preparation, Can-Do members held a meeting last month encouraging all to stay on top of all the issues involved, including the lawsuit they have filed against Hillsborough County and Developer Red Cast Bloomingdale LLC, involving the Bloomingdale Ave. development project. Hillsborough County filed a motion to dismiss the lawsuit on Monday, January 6. On Friday, January 10, the developer also filed a motion to join the county’s motion to dismiss. For more information about the Bloomingdale Big Box project and Bloomingdale Can-Do, email BloomingdaleBigBox@gmail.com.